Start with a social gathering at Spinnaker Point from 10-noon, launch your boat, start at 2pm, dash around a couple islands and various marks and finish. 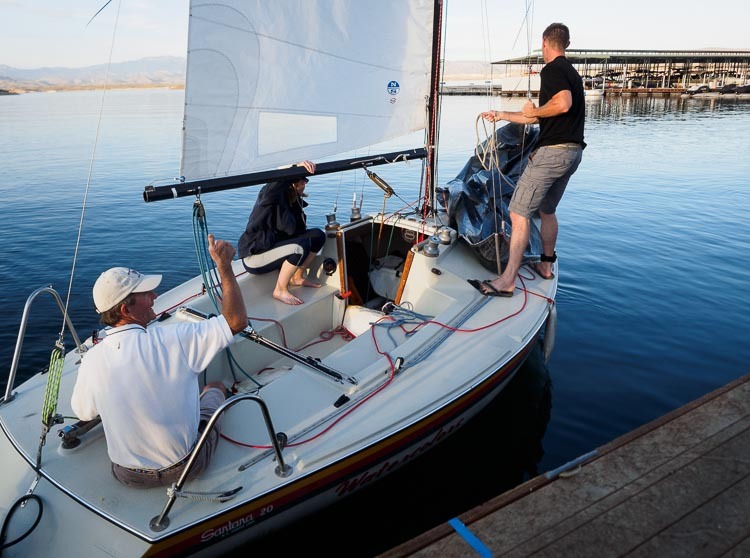 That’s this year’s Tall Cactus Regatta, our fun pretty-much-end-of-the-season regatta, Saturday, April 27. Register now on the Racing page, where you’ll also find the chart and the documents. 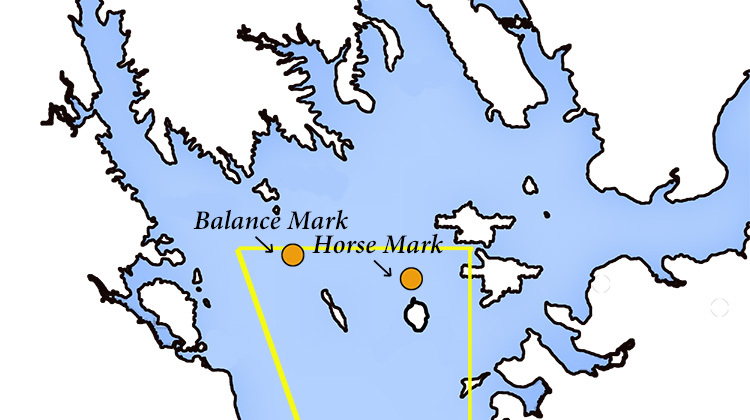 Principal Race Officer Rob Gibbs has answered one important question before you ask: Yes, you do have to sail around Horse and Balance Rock islands in addition to the drop marks at those locations. A chunk of the Tall Cactus race chart showing the route around the northern islands of Lake Pleasant. 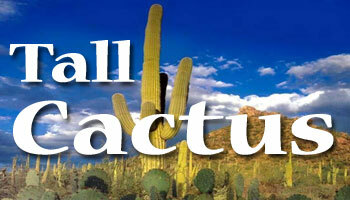 Our sister club in Tucson is hosting its annual San Carlos Cruise beginning October 22nd. 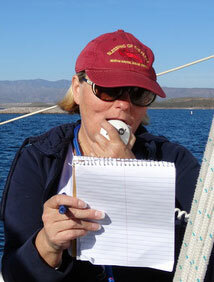 Ports of call will include San Pedro Bay, Las Cocinas anchorage, and of course San Carlos. For more information visit their website page about the cruise or contact Richard Sebastian, at iwmfg@comcast.net or phone 520-404-8370. First Annual Officially Unofficial Catalina Flotilla! 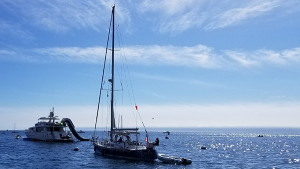 Last weekend AYC Sponsored a Flotilla to Catalina Island, and what a great time it was! The sailing between Long Beach and Catalina was some of the best wind I’ve ever had both ways. On our way out the we had the sails up as we rounded the Carnival Cruise Ship Terminal and sailed out of the Long Beach Harbor entrance. On our boat we had 5 kids and 3 adults. 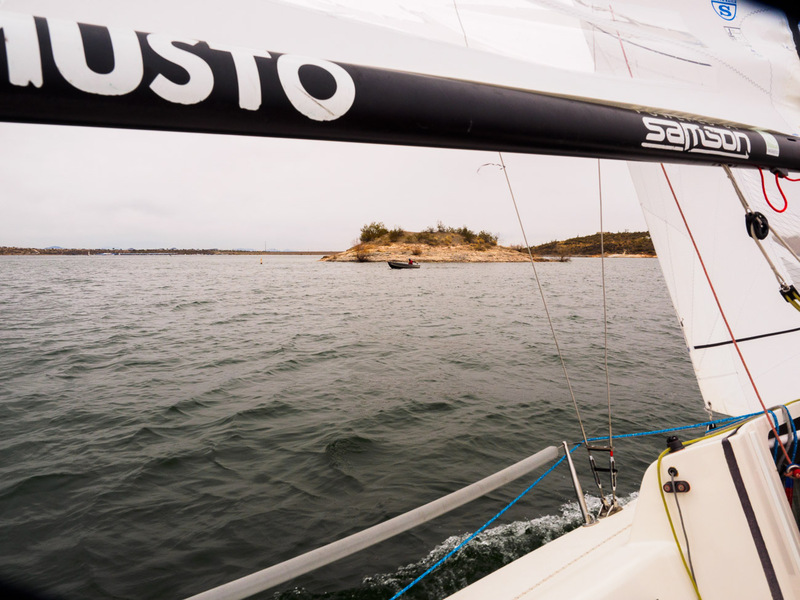 We sailed until we dropped to 4kts and saw that mooring balls were becoming scarce. We motor-sailed the rest of the way. We spent the first night (Friday) in Descanto Bay, just north of Avalon and open to the ocean. 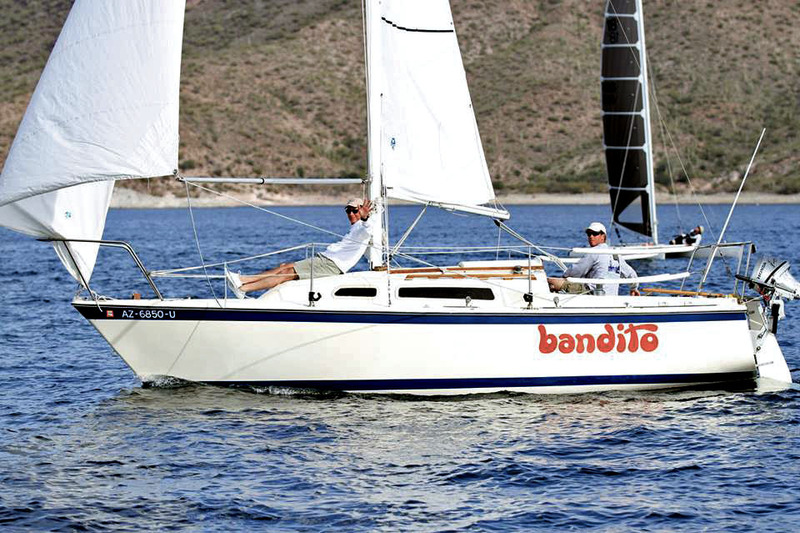 We caught up with our flotilla members Jim and Marilyn Nelson on their Hylas 46 Liberte. We had dinner ashore at Charlie’s Steak and Seafood which was amazing fresh caught fish! Being in Descanto Bay, the dinghy ride was about 10+ minutes one way and it was moderately rough night out in the open ocean, but being outside in the sun all day, sleep was found pretty easily by all! The next day (Saturday) we cooked breakfast on the boat and planned our day ashore at the beach. Liberte chose to head up to Isthmus Cove at Two Harbors so we bed them a fond farewell. We dinghied into Avalon and got set up on the beach. The kids swam and played in the water and on this massive inflatable fun platform Avalon has set up there. At about 10am we got invited by the Avalon Harbor department to move into Avalon Harbor so My daughter and went over and moved the boat to its new mooring. Later, we had dinner at the Catalina Cantina. Now that we were in Avalon Harbor, the water was much calmer and we had a better evening’s rest. 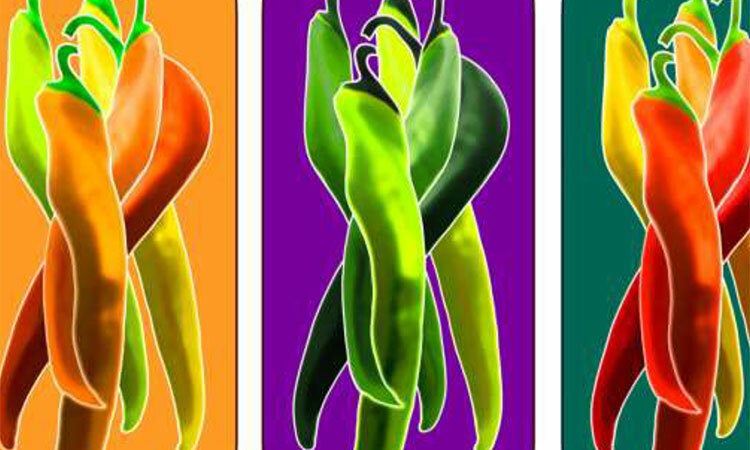 Our Ship’s Compliment – 3 Gibbs’ and 5 Moreno’s! The next morning, we cooked breakfast on the boat and made one last trip to shore for ice. We left Avalon, right at 9am, which is checkout time, and motored out of Avalon for about an hour. The wind came up early and we set sail. The USCG was broadcasting a Small Craft Advisory for 3pm with winds 20-30 MPH. We reefed when we started to see 7kts of Speed over Ground and then saw 7kts again under reef within about a half mile of LA Light (AKA Angle’s Gate). 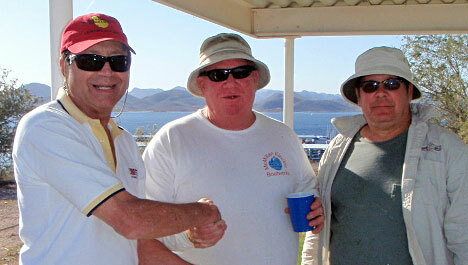 Next year we are planning to arrange this in conjunction with the Tuscon Sailing Club who’s trip was the week before! Maybe even expand it by a day to catch a night in Two Harbors! Kim OlsonGibbs sailing to Catalina! We’ve got a great group ready to go to Catalina next weekend! Arrive Thursday the 19th late in the afternoon. Provision the boats. Enjoy Dinner Ashore on Friday Night! Saturday the 21st…open! Move harbors? Go for a day-sail? Explore the island? Visit other AZ Boats in the harbor? Dinner Ashore! Sunday the 22nd we’ll leave our mooring by the required time (usually about 9am). Depending on the forecast, we may find a cove and anchor for a while or head back. Depart the morning of Monday the 23rd for home. There is still time! Get yourself a charter (or trailer your boat over) and join us! If you do, let me know you’re going to be in the area by emailing Commodore@ArizonaYachtClub.org or hailing our boat “Avalon” (Yes, that is the boat’s name) on 16 when you are underway! We’ve seen quite a bit of interest for our Officially Unofficial Flotilla to Catalina the weekend of July 20th! People that are looking for crew, people that want to go but would like some crew, even people that might be interested in getting certified while heading over. In order to facilitate all of this, we’ve created a free sign up form. If you are even considering going, please fill it out and we’ll try to do some matchmaking and see that everyone that wants to go gets to go! It’s heating up in AZ and soon we’ll all start hiding in the comfort of our air-conditioned homes, offices, and cars. 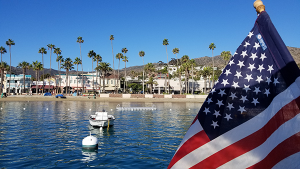 What a better way to escape the heat than to go sailing on the waters of the Pacific… and Catalina Island is a great destination. 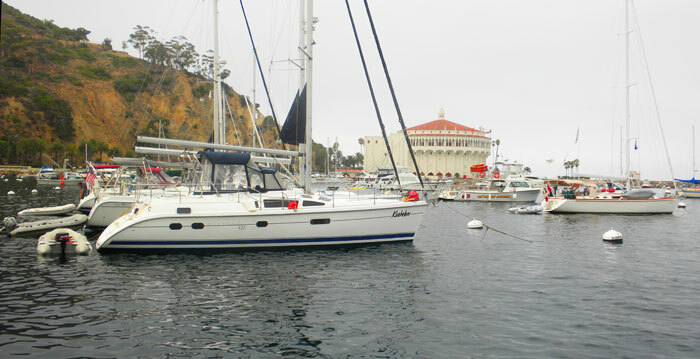 The weekend of July 21-22 will be AYC’s Officially Unofficial Flotilla to Catalina! We’ll keep it really simple. Just show up in Avalon sometime that weekend. Need a boat? 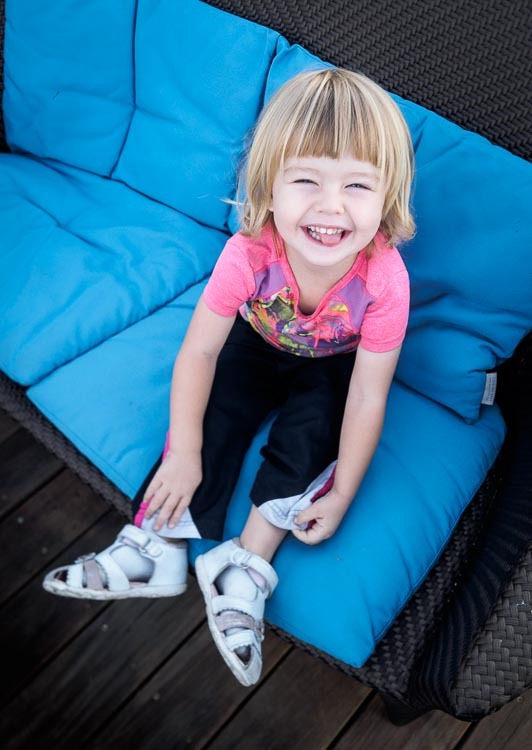 There are several options from Marina Sailing and Harbor Island YC and others. Or just ferry over on the Catalina Flyer to hang out with the group. Your flotilla host will be Rob Gibbs, AYC’s Vice Commodore. Not been on a charter before? No problem! We’ll make an effort to prepare anyone who has questions about chartering. Never been to Avalon? Going with a flotilla is a great way to enjoy a new cruising grounds and get tips from people that have been before. Been to Avalon a bunch? Great! Come give us all the inside info! If you’re interested or want more information, please email RobDaSailor@gmail.com. 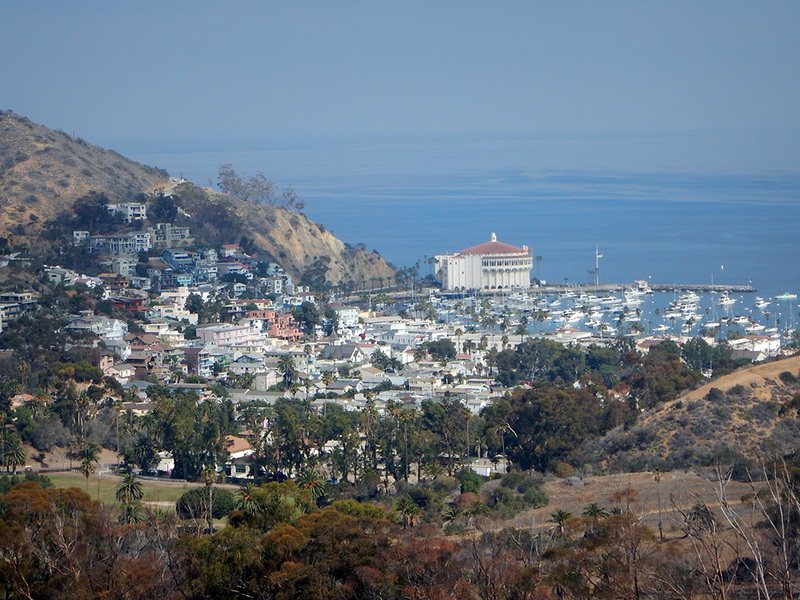 Avalon Harbor on Catalina Island. 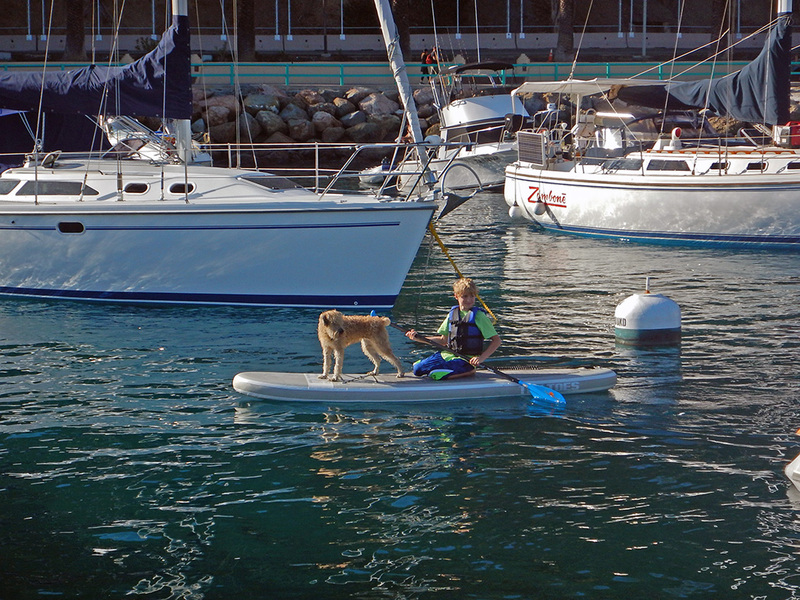 Cruising to Avalon is great for the entire family, including the kids and the dog. It’s a bit of a gamble with a pursuit race. 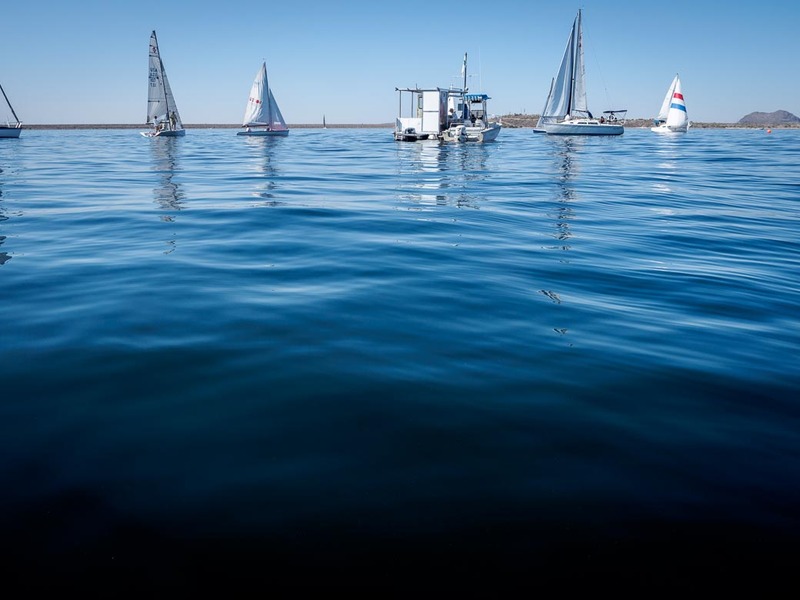 With some 41 boats entered in this year’s Tall Cactus, which ones would benefit from a light wind start and which ones would gain as the wind came up? By the time they’d all gone around Horse, Balance Rock, and Bobcat Islands and crossed the finish at Scorpion Bay Marina, Sport Boats had passed everyone who started before them and finished 1-2-3. It was Court Roberts’ team (with Tony Chapman driving, Bob Whyte trimming) in the lead, followed closely by Mike Hester (with Joel Hurley), and not so closely by Mike Ferring (with Maryellen Ferring, Ray Chapman, and Gail Palmer). Then all that was left to do was to party on the deck at Scorpion’s Grill on a beautiful Saturday afternoon. Many thanks to Regatta Chairman Tom Errickson and to his helpers, including Tom Ohlin and Andy Oliver and several others. Ready to chase the Tall Cactus? The race is Saturday, April 28, with the first boats starting at 9 am. This is a pursuit race, in the style of the Governor’s Cup, which attracted over 50 boats in December. Okay, it’s a carbon copy, except that this time everybody will find all the islands and the finish line. Or they should. Now, what was that about “Bobcat Island”? It’s the chunk of land that we’ve been calling “No Name Island” up to now, but Event Chairman Tom Errickson has learned it’s actually and officially called Bobcat Island. How to recognize it? It’s very hard to see until you’re right on top of it, since it blends into the hills behind. After rounding Balance Rock, if you set a course for about 150°, you’ll be pointing in the right direction. Aim to the right of the cell phone towers on the hill. You’ll need to clear the point at Two Cow Cove, near where the Sheriff’s station sits, and then head a little to the right. The GPS coordinates are (approximately) 33°51′17″ N 112°16′50″ W or, in decimals, 33.854853 N 112.281728 W.
After Bobcat, go to Scorpion Bay Marina, round to the north of all the breakwaters and sail toward the shore. You’ll spot the finish line. Finish and then tie up and join us for adult beverages. Here’s a satellite picture of Scorpion showing the finish line. Here are pictures showing Bobcat. The pictures were taken in early March, with high lake level. 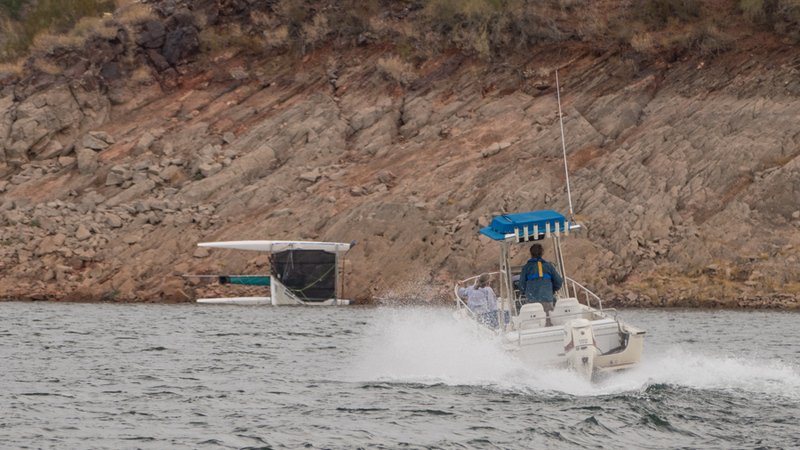 Martin Lorch and crew managed to out-race 50 other boats to take the gigantic Governor’s Cup at Lake Pleasant Saturday (12/2). The wind was fairly typical for the lake, with moderate northerly wind until close to noon when it shut down completely, rising again as a light wind from the south an hour later. It’s a pattern that favored the early-starting boats in the pursuit race and George Tingom made it pay off for him, sailing solo in his Capri 14.2. George had a big lead in the race but made a fateful error when he rounded the wrong “unnamed island.” George contends that the race chart was too vague, so he didn’t know which small island to round. As far as we know he was the only one to make this mistake, but it’s always most difficult to know which way to go when you’re leading the race! 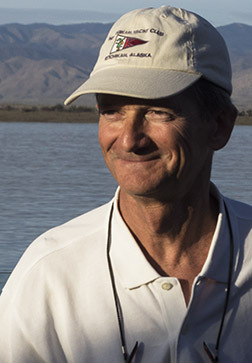 Jim Tomes was the fastest and first multi-hull entrant to finish, capturing that fleet’s award. First multi-hull non-spin was Chris Picknally. 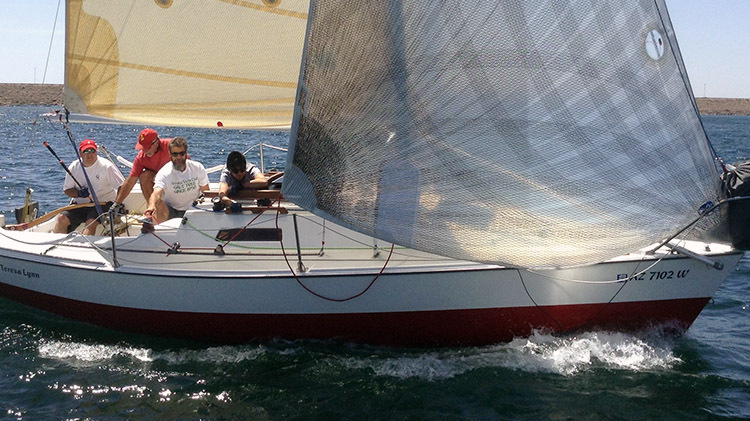 First monohull non-spin was Richard Krebill in a Capri 14.2. Tony Krauss was the first of four Hobie 16s to finish. In addition to the big trophy, winners in three divisions (spin, non-spin, multi-hull) won sailing bags donated by SLO Sail and Canvas, makers of sails, boat covers and other canvas products. 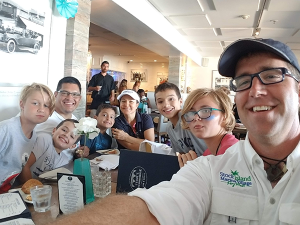 The race ended at the Scorpion Bay Marina Grill with a post-race party. Thanks to Race Organizer Tom Errickson and his volunteers, Tom Ohlin senior and junior and Bill Cunningham. 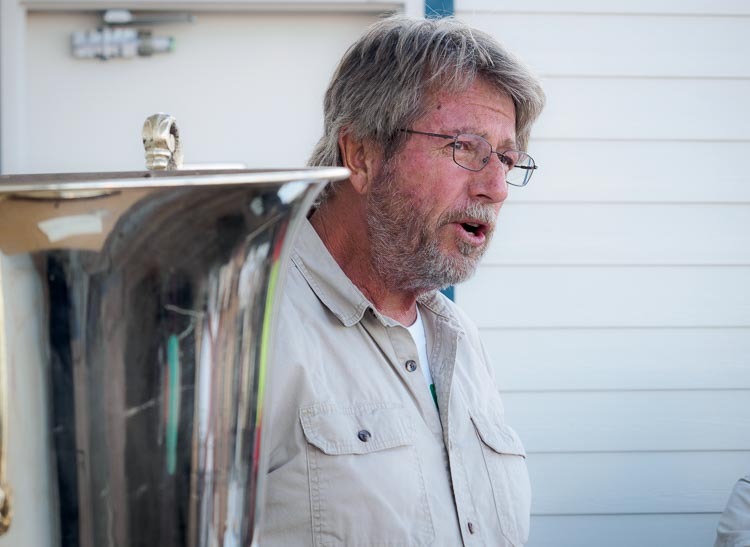 Dave Christensen consulted his well-worn chicken bones to come up with the handicap ratings and start times for the pursuit race. Here is a picture of the handwritten finishing order at Scorpion. 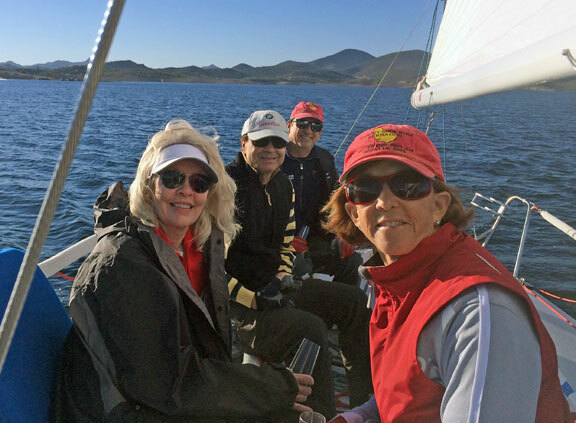 The 2016 Governor’s Cup Regatta will take place on December 3rd at Lake Pleasant and this year introduces something new, different and exciting. Here’s the scoop. There are two categories: A pursuit race much as we’ve done it the last several years and a straight-up PHRF race. The Pursuit Race is an informal twice-around-the lake long distance sailing event starting at 10 am. The winner takes home the traditional really big trophy. Info and registration here. Registration is $10. The Other Race is a full blown PHRF twice-around-the-lake race. Two sections will be scored, Monohull boats (starting slower-rated boats at 10:30 and faster-rated ones at 10:35) and Multi Hull (starting at 11). Registration is $25. 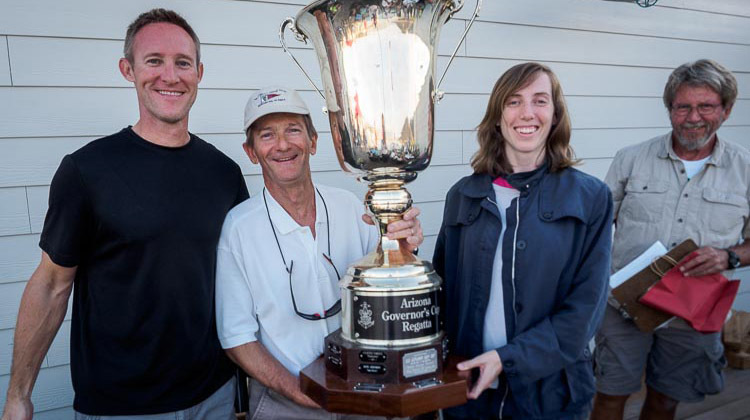 The 2016 Governor’s Cup is also the first of three regattas that comprise the AYC TRIPLE CROWN. The new Triple Crown combines our three non-series regattas: The Governor’s Cup, the Leukemia Cup-Birthday Regatta and the Tall Cactus. Further information and registration for all of these regattas will now happen at a new AYC website, www.aycregattas.com. The new site is intended to help promote these three events outside of Arizona, throughout the Southwest and Pacific Coast. None of the things the club does can happen without the dedication and commitment of members and volunteers. Thank you to all involved. 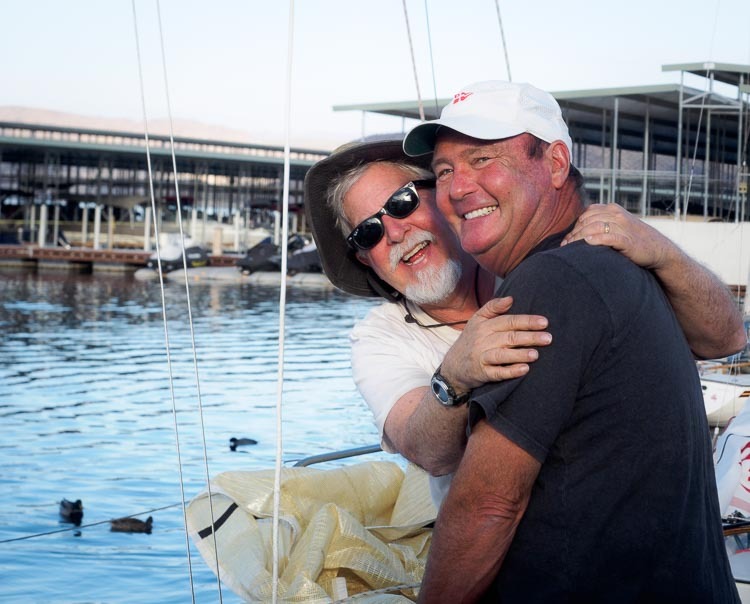 On a windy, puffy, shifty day, Tony Krauss of Tucson sailed a Hobie 16 to the multi-hull win and Emory Heisler and Tony Chapman took the mono-hull in an 18-foot Buccaneer—and it wasn’t even close. Here’s a drone video of the event, produced by Duane Darling. And here’s some on-board video of Chris Smith fighting his Laser in heavy wind. This was the spring pursuit race, where all boats start based on their PHRF rating, with the boats with the biggest PHRF number heading off at 11am and then boats with lower numbers trickling off the line after them. If the PHRF ratings are right, if the conditions match the handicap, and if everyone sails skillfully, all boats finish at the same time. Emory and Tony started at 11:27, put up the ‘chute and started passing boats. 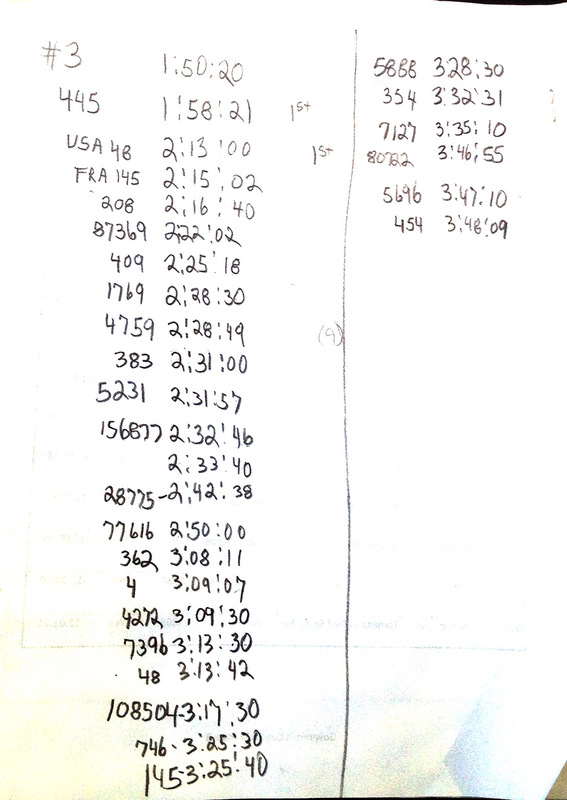 By the second lap of the course (dam-> Horse-> Balance-> Vegetation island-> and do it again), they were well in front and completed the 14-mile race in under 2½ hours. But Tony Krauss was even faster, finishing in just over two hours. Crossing the finish second in mono was Steve Kusic and the Merit 25 Runaway team. In third was Mike Ferring and the J/80 Melissa Kay crew. Charles Landis aboard Circuitous finished fourth. Sometimes it seems as if cruisers and racers are different breeds. One values comfort and a cocktail at anchor while the other wants screeching heel angles and screaming mark roundings. But some of us think both things are a kick and would like to see more cruisers try racing. But how? And (of course) why? It makes you a better sailor. Here’s a link to that excellent Sail magazine introduction to racing for cruisers. 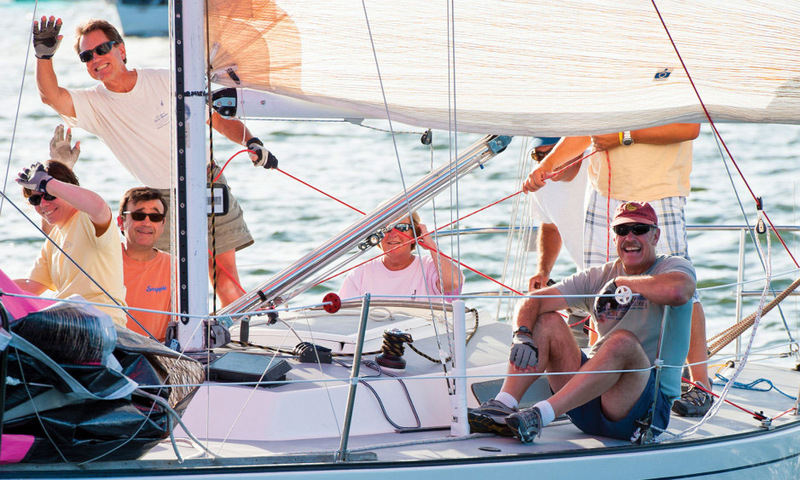 AYC offers several entry-level races for cruisers who want to try out racing. 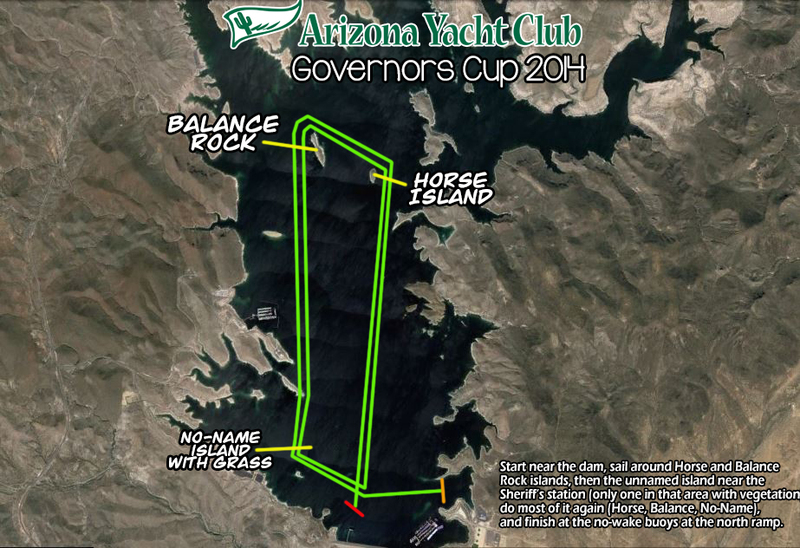 There are “pursuit” races (see the Sail article for an explanation), typically the Governor’s Cup and the Tall Cactus. Boats start in reverse order of their PHRF rating (yes, see Sail article) so the start is simple and uncrowded. Then it’s just a matter of sailing the course as fast as you can. 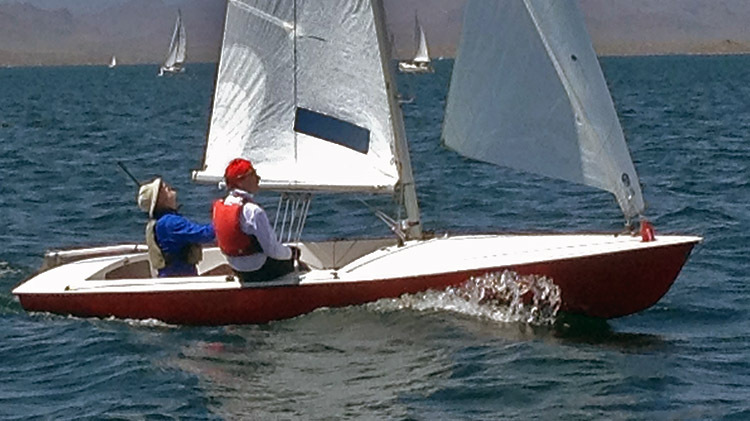 The 2015 Tall Cactus Regatta was one to remember for the 19 boats that raced in breezy and blustery conditions. Knockdowns and round-ups were the conversation at the post-race get-together. Court Roberts, sailing his Melges 24 was first to finish the 14 nm course in just over 2 1/2 hours. The pursuit race with slower boats starting before faster boats brought a very close finish, with the second-place Catalina 22 of Scott Battle only seconds ahead of the third-place J/80 of Chris Smith. The event is in Two Cow Cove (see map) and boats will start gathering around 1 pm. You can monitor the traffic on VHF channel 68. Here’s a flyer with further information. LPSC offers a word of warning: Lake Pleasant party boaters are shooting for a world record raft-up of 1000+ boats tied together in Humbug! Traffic at launch ramps and parking lots could be intense. Here are this event’s entries and start times. 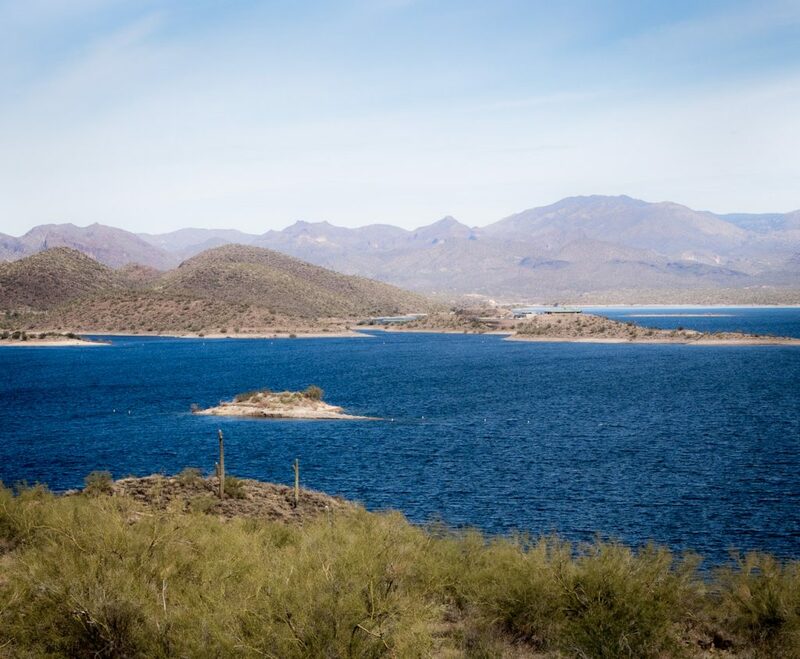 How about a fun run around Lake Pleasant? That’s the format for the Tall Cactus regatta this year. A straight duplicate of the Governor’s Cup Regatta. If you enjoyed that one, you should like this one too. Registration is now closed for this event. Here’s a link to the NOR/SI. This is a “pursuit” race, where boats start based on PHRF rating, with the slower boats beginning first at 11 am and faster boats starting throughout the next hour or so. The start line is near the dam, at the mouth of Pleasant Harbor Marina. 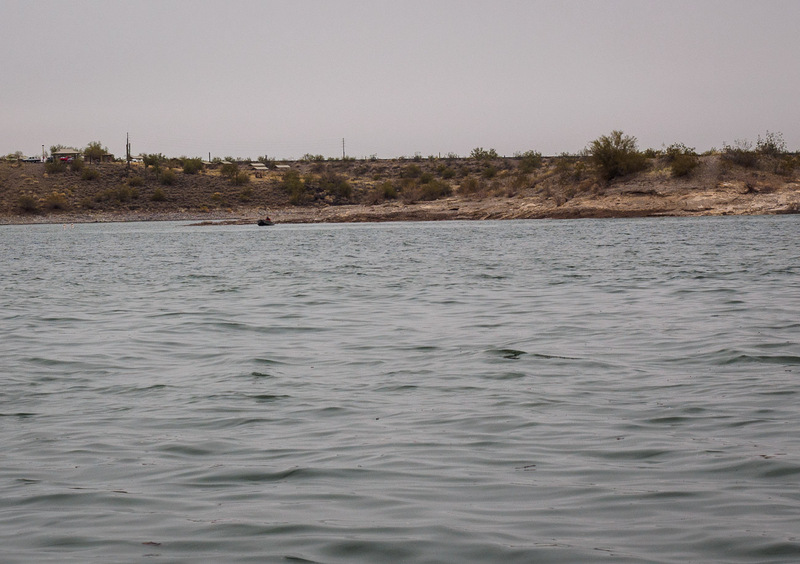 Boats will charge up the lake, around Horse and Balance Rock and then back south around the “island with vegetation” in the vicinity of the 10-lane boat ramp, taking all islands to port. Here’s nice, big color map of the lake for reference. After making the loop twice, the first boat across the finish line at the “no wake” buoys near the north launch ramp will be the overall winner. Boats should keep track of their own finishing positions. Then, adjourn to the bar for (included in your entry) appetizers and (not included) beverages. Entry is just $10. Questions? Check with event organizer Tom Errickson. The Tall Cactus course, just like the Governor’s Cup course in December. Last to start, first to finish! 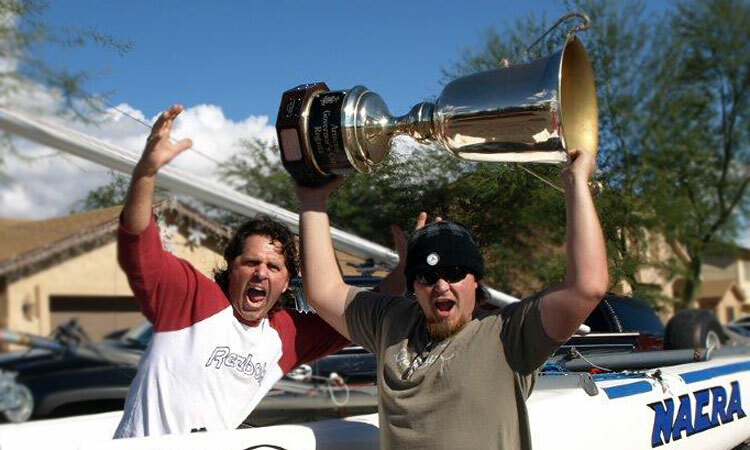 Brett Johnston won the 2014 Arizona Governor’s Cup Regatta sailing his Nacra Inter 20 Catamaran. Brett and his crew Crew (that’s really his son’s name) picked their way through 32 entrants in light and shifty zephyrs for this year’s regatta. Brett had the last start time, one hour and five minutes after the first boat to start in the pursuit race. Brett gets to keep the gigantic Governor’s Cup trophy (see picture) for the next year. He’ll accept the trophy at Tuesday’s monthly meeting. In fact, all the entered catamarans dusted the monos, making the best of the light air and finishing about four hours after they started. 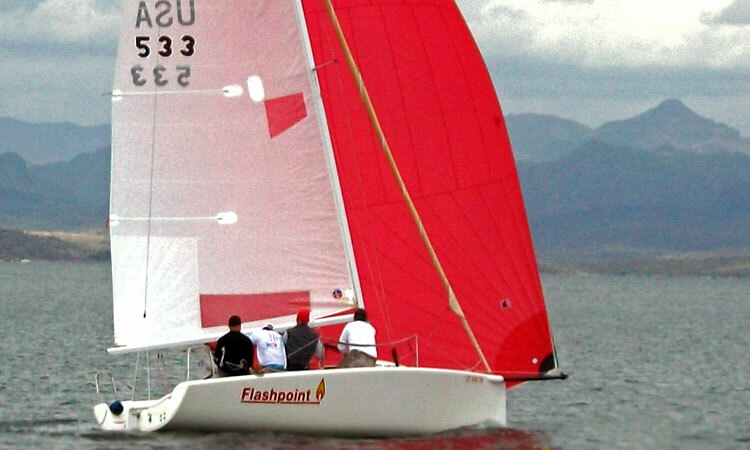 Best finishing mono was Court Roberts in his Melges 24, working his way into the cat fight. The event organizer was Cruising Captain Tom Errickson, who opted for a simple format this year: A pursuit race where the slowest boats start first and the fastest start last. Start near the dam, sail around Horse and Balance Rock islands, then the unnamed island at the south end of the lake (an island that’s the only one in that area with vegetation), do most of it again (Horse, Balance, No-Name), and finish at the no-wake buoys at the north ramp. 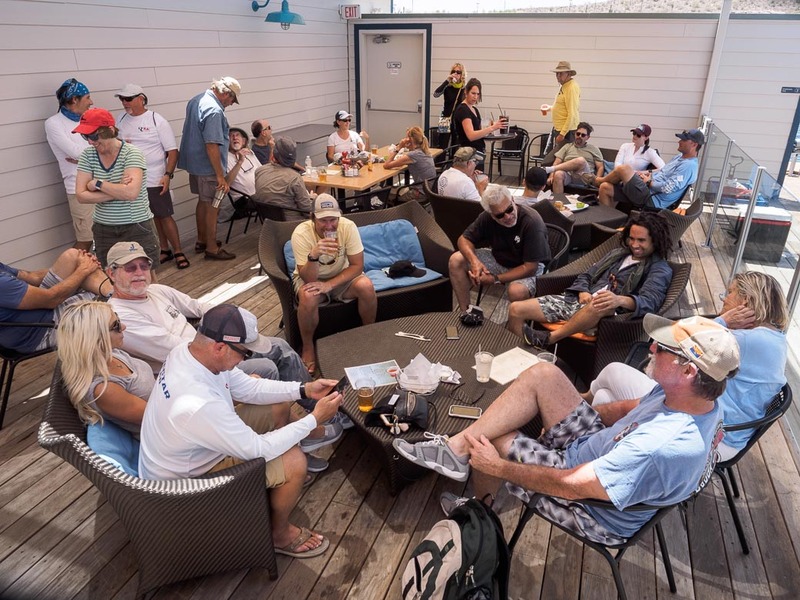 After the race, everybody was invited to the Pleasant Harbor Marina Grill for a no-host bar and some munchies. Entry fee is $10, member or nonmember, and everyone is invited. 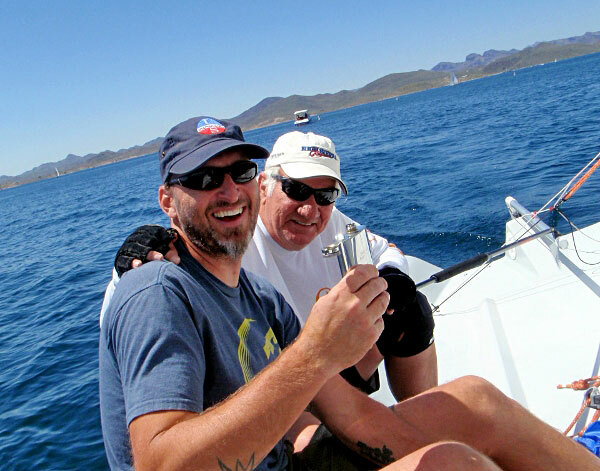 Tom notes with a wink that this Governor’s Cup had Jan Brewer on the race committee boat. Yeah, really. But this Jan Brewer might bear only a passing resemblance to the one occupying the Governor’s office. Yeah! Brett and Crew Johnston won the Governor’s Cup and get to keep it for the next year. Lots of wind and sun made the 2014 Tall Cactus regatta nearly perfect—sprinting from Pleasant Harbor Marina, around the Cole’s Bay marker, Balance Rock, and to the no-wake buoys at the North Ramp entrance. Less than two hours for winner Steve Brown and his Viper 640. 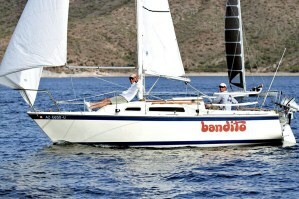 Just a few minutes later Scott Battle crossed the line in 4th, putting his Catalina 22 first in the non-spin division. It began with a staggered start, the C22s at 11 am, the Vipers and Dave Christensen’s Mini 650 some 40 minutes later and the rest arrayed in between. Spotty wind at the start spread the fleets until things began to even out later in the north leg, a downwind number. 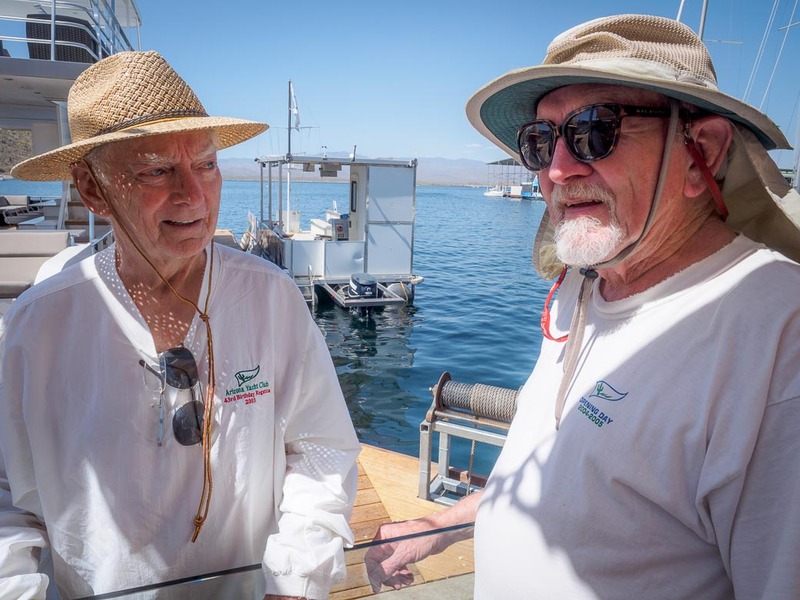 And it all wrapped up over shishkabobs at Spinnaker Point, with living trophies presented by event organizer Ralph Vatalaro—appropriately, small cactus plants that one day may grow to mighty Tall Cactus. 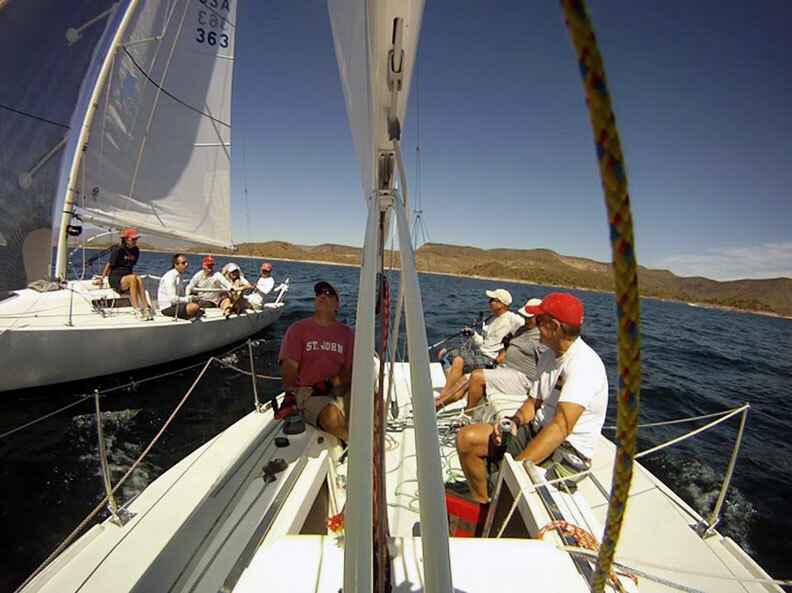 The Tall Cactus Regatta returns to Lake Pleasant on April 12. Sign up by clicking on the button above. Note: This is a new registration system, so let us know what you think of it. You’ll pay through the PayPal system, but you’ll have the option of paying as a PayPal guest using any credit card. 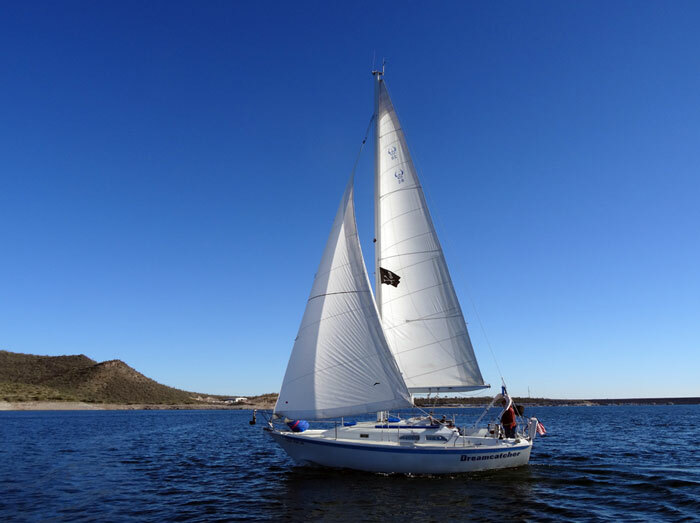 For this annual event, we’re looking forward to a casual sunny cruise around the islands and coves of Lake Pleasant, finishing up at Pleasant Harbor. After the finish, we’ll gather at Spinnaker point to celebrate our success at navigating Lake Pleasant’s treacherous waters with a tot of grog and other refreshments at a barbeque. 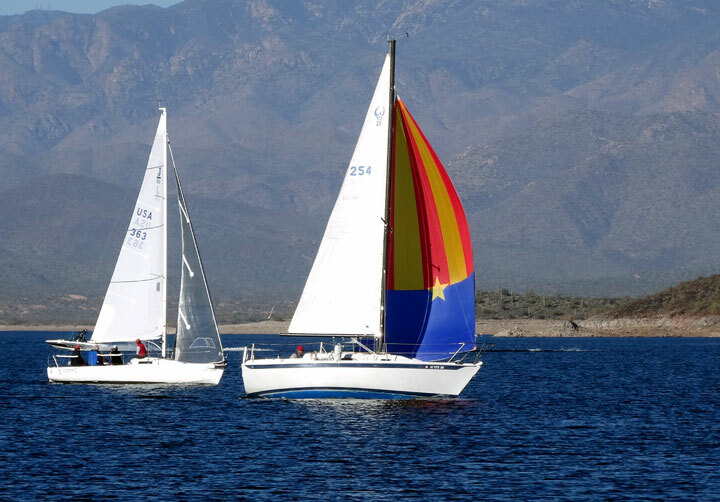 We would like to extend a hearty invitation to our friends in the Lake Pleasant Sailing Club and other sailing groups to join us in this annual floating fiesta. Saturday, April 12, 9 am skippers meeting, 11 am start. 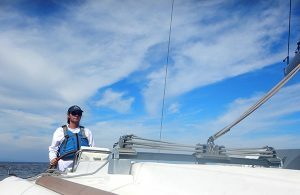 The starting sequence will be based upon the PHRF rating of your boat, with the highest numbers starting first. Cost: $25 per entry. Each entry comes with one dinner. Each additional dinner is $10. Kids under 16 eat free. You’ve heard of the TransPac. Now there’s a shorter race called the TransLoch. 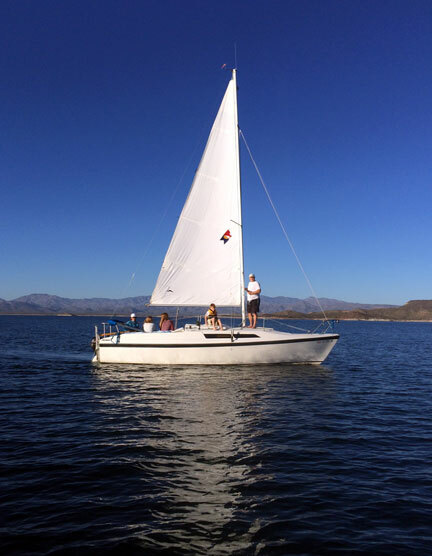 It “trans” Lake Pleasant and it’s custom created for cruisers, right down to the fun-friendly PHRF adjustments. It will be Saturday, January 18, starting at 10:45 am, run in conjunction with the Birthday Regatta & Leukemia Cup. Here’s the description of the course. 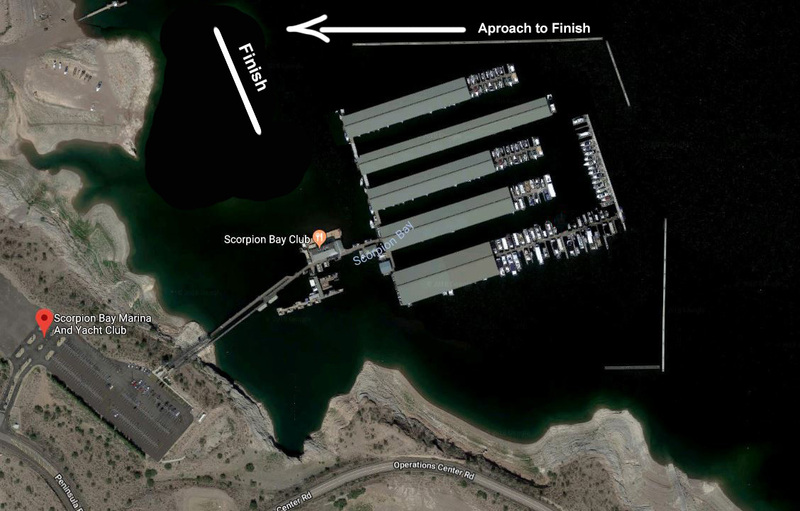 The TransLoch Cruising course shall be from the start line, around the North side of Horse Island, then around the North side of Balance Rock, then around the South side of the small unnamed island at the south end of Lake Pleasant near the dam Overlook Visitors Center (33*51.07 N, 112*16.57 W) then to the finish line. Round all marks to port. The TransLoch Cruising Class shall be limited to boats that are fully equipped to cruise, including a full interior with galley and head, minimum of two anchors, Dacron or Nylon sails only and operational motor. Finish order will be determined using Southern California PHRF handicap. Starts will be broadcast on VHF with countdown. Here’s a map with the information. Here’s more information on the Birthday Regatta & Leukemia Cup. If the rest of 2014 goes like day one, it should be a great year. 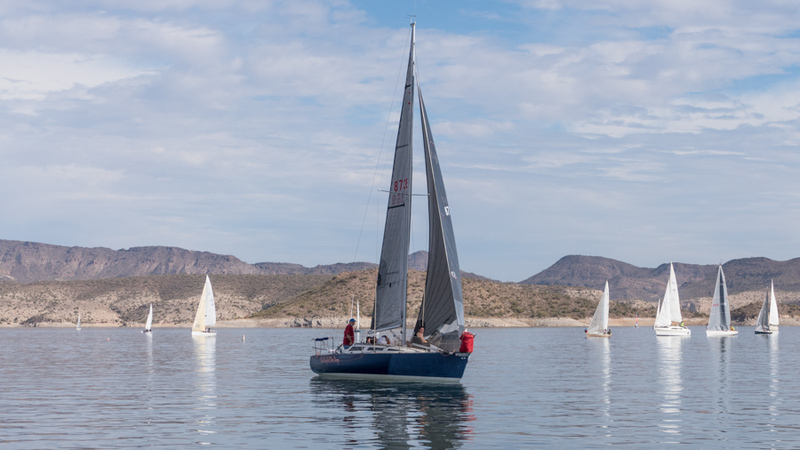 A dozen or so boats from AYC and the Lake Pleasant Sailing Club gathered in sunny, 70-degree temperature and fair wind to show what it’s like to live in Arizona. 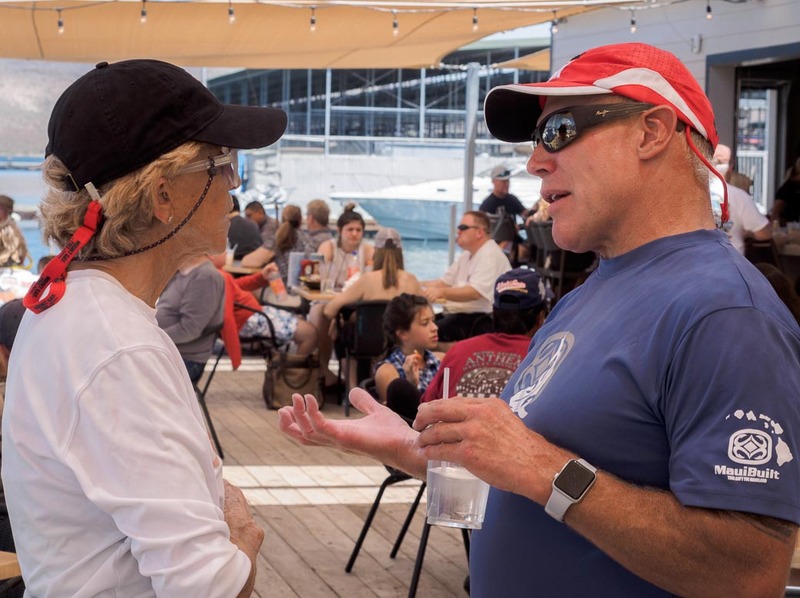 Rhonda Brewer posed football questions on VHF radio while the fleet milled around celebrating the day and then convened at the Waterfront Grill for $5 hamburgers and $2 beer. 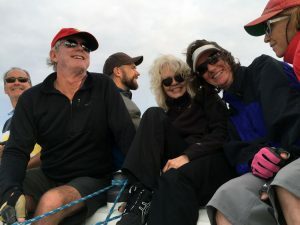 On our boat, Cruising Captain Ralph Vatalaro, former Rear Commodore Bob Whyte, Becky Houston, Maryellen and I hoisted the spin and sped around Horse Island while Maryellen popped a couple bottles of celebratory champagne. A very nice way to start a new year.